We’re just back from quite an amazing afternoon. Today the Little Asby Hawthorn had a transformation. It has been leafless since late October: high on the limestone scar of Little Asby Common winter comes early. This afternoon, we added a fresh canopy of leaves to it, each leaf carrying a memory, a story or a dedication. Each message was one of love or positive affirmation. We were surrounded by love and good wishes, fond memories, words of celebration and hope. The mist that had greeted us on our arrival cleared and the winter sun sent its long gold light onto the tree and its fresh green dressing. This is the third of the tree transformations that are part of The Long View: one colour of the rainbow for each tree. 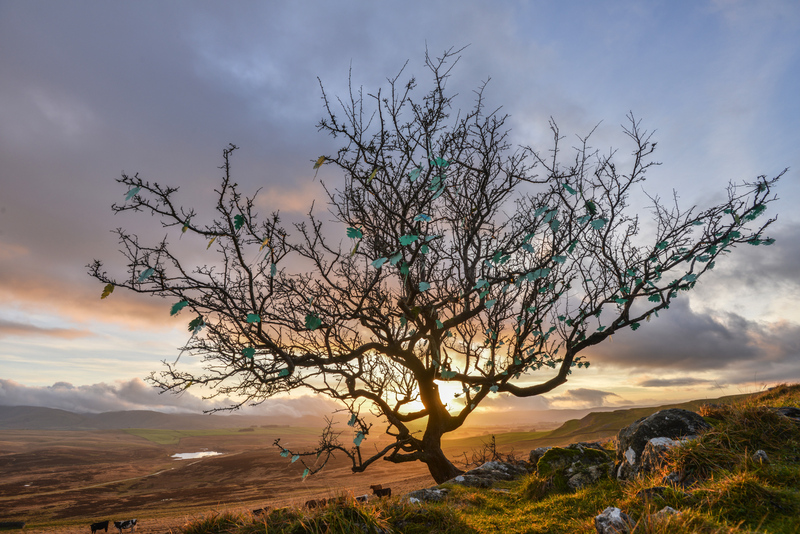 We chose to decorate the Little Asby Hawthorn with leaves drawing on traditions of tree dressing that are a way to celebrate trees, bring people together and provide a place for sharing memories and stories, and commemorating loved ones. Many of the leaves were filled in by members of Friends of the Lake District on whose land this resilient hawthorn stands. 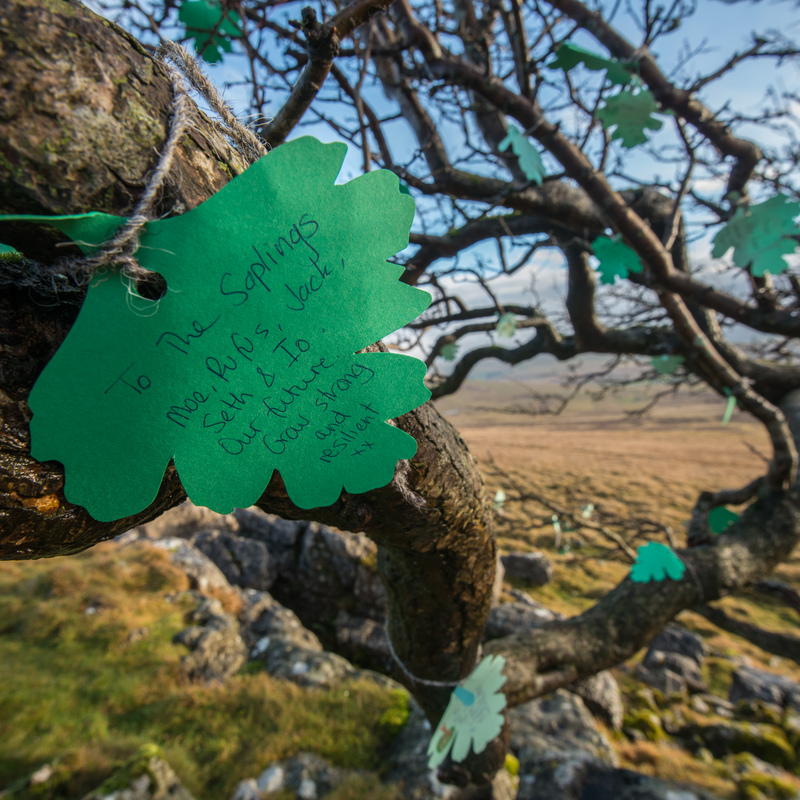 There are leaves here written on by people who have walked with us over the summer; some come from family and friends; others from school children and their teachers and parents. 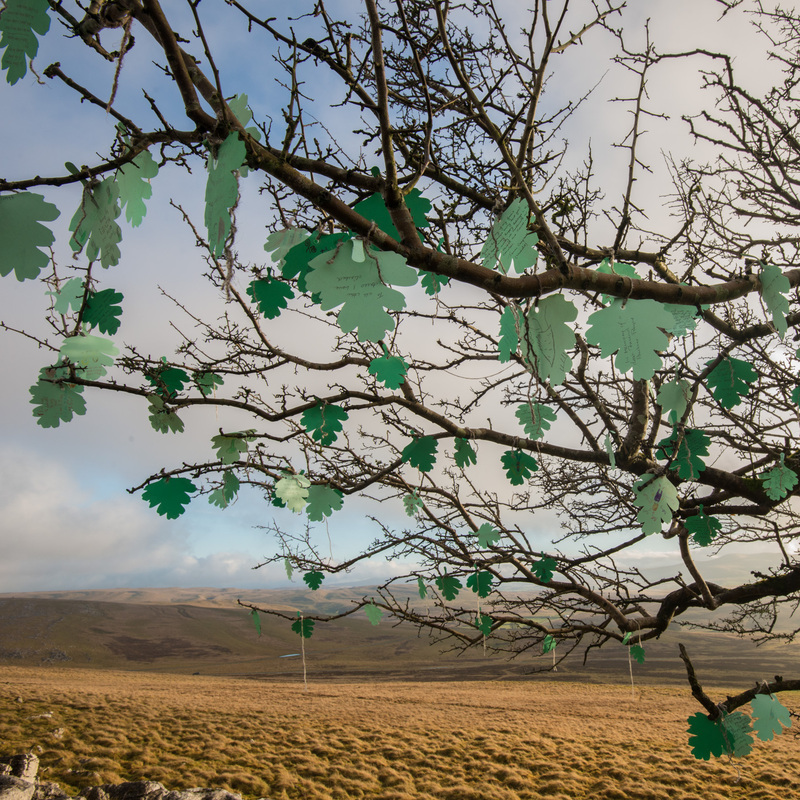 This single hawthorn has become a platform for messages that are overwhelmingly full of love and celebration of special people, relationships, places and, of course, trees. It has been very moving to be part of this, to read each message, and to stand beneath the tree in the midst of this outpouring. Each colour of the rainbow is linked with one of the seven chakras in the body (you can read more about our thinking behind this here). Green is the colour of the fourth chakra, which is located in the heart. It is symbolic of love, balance and relationships. The element linked with the heart chakra is air, so what better way to send messages of love than on the wind? Each time we approach the trees that are part of The Long View our hearts rise and we smile – our relationships with them are deepening. This hawthorn has become a familiar and we have sheltered with it in rain, wind, hail and snow; we’ve been calm with it in windless sunshine, in starlight and moonlight; and reveled in the glow of dusk and the roaring red of sunrise. We feel protective and we care about it – and we have discovered that many other people also have a special affinity with this tree, which offers a space for pausing and taking in the wide open landscape around it. We have sat beneath its shade with a group of thirty children, introduced people to it through organised walks, strolled to it with many friends, and today had another small gathering to dress it with leaves. The heart chakra, which is said to inclines us towards friendship and being social, is in full swing! You will know the sensation of love; similarly, you will probably know sensation of losing someone you love, the feeling of grief and the need to acknowledge people who have been important and made a lasting impression. 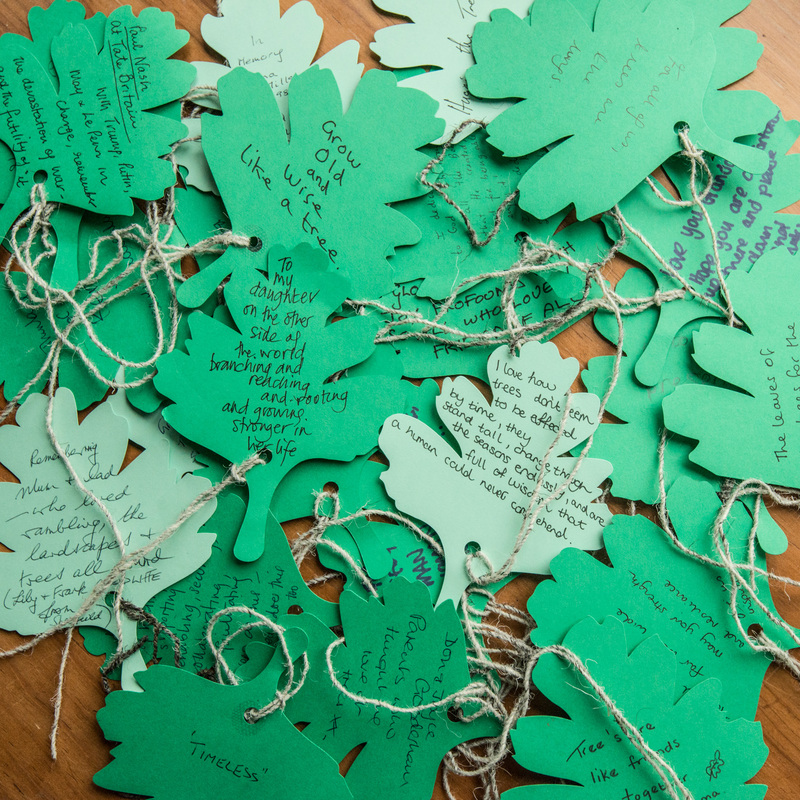 The dedications to loved ones on these leaves have moved us to tears, not through the pain and sadness of loss but through the warmth of remembrance and celebration of love and experiences shared. Many of these dedications include a thank you for an introduction to a love of the outdoors and to particular places, and there are more than a few that celebrate the passing of this love to the next generation. Many of the dedications on the leaves address the planet and its species, and express a wish that we will find balance of some sort. This taps into a way of thinking that has always been part of The Long View, which is a celebration of the world in which we live, and a concern for what happens when there is loss. The pain of falling out of love or the pain of loss is a sensation often felt in the heart. It comes in different strengths: when we lose a loved one, when a favourite tree dies, when a species is declared extinct. Sadly, no day goes by without some bad environmental news; only yesterday we heard about ‘700 acres of white birds‘: snow geese, dying and dead, killed by contaminated water in an industrial pond in Montana when they rested on their long migration. The heart is the midpoint of the seven chakras, like an anchor or balancing point between the capacity to speak, imagine and reason, and the sensuality of the physical body. Love is like a glue that bridges these, and with it connections are forged and cemented. Amid all the science and statistical measuring, love seems hugely relevant in today’s world with the pressure of climate change, habitat loss and resource depletion: when you love something, you unthinkingly want to care for it, don’t you? Working out how to solve all the world’s environmental problems is hugely overwhelming but on a local level, each small action, emerging from considered and joined-up thinking, does matter: making time for cementing our connection with the planet around us and noticing what might make a positive difference, such as caring for old trees, planting new trees. Small acts, like the soft words sent to the wind with hope and positivity, can have repurcussions. The leaves of dedication will be temporarily in place. Their removal is dependent on the weather so we will retrieve them either at midwinter or before if the weather turns, and dry them out, and store them. 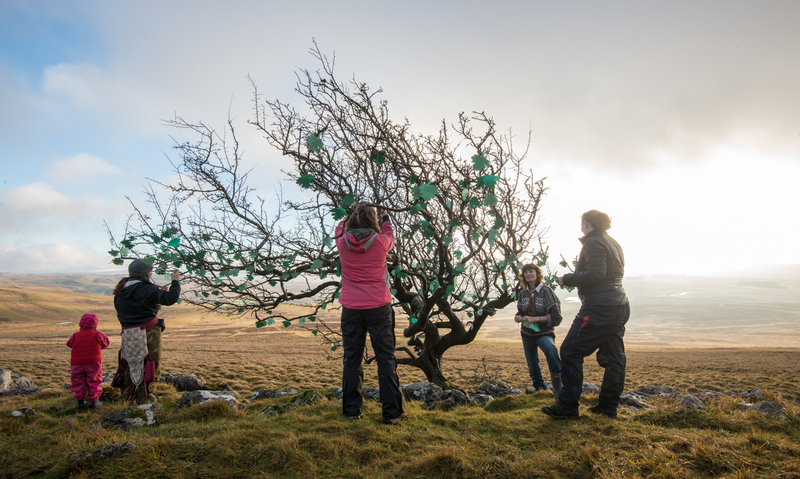 Huge thank you to Friends of the Lake District for sending the leaves to members and for helping us to reinforce and thread them, and to Ruth, Janine and Jan for joining us at the tree today for the dressing. The leaf design was drawn by Kate Brundrett and it was brilliant to have Kate with us as well to add to the canopy. The paper (which is hardy and weather proof) has been provided by James Cropper PLC, the herdwick wool ties were donated by Jane Exley (from the Woolly Rug Company) and the leaves were cut for us at Stramongate Press. And thank you to everyone who wrote and drew on the leaves. A real team effort, thank you!